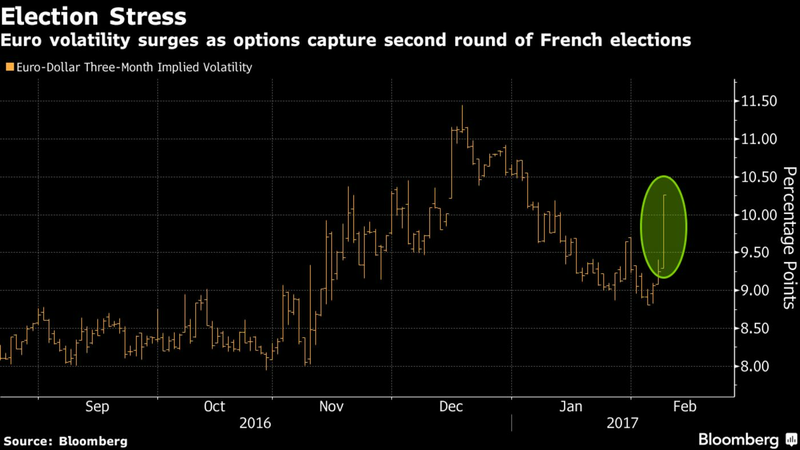 Treasuries rose for a fourth day and gold reached a three-month high as demand for haven assets persisted with investors assessing political risks in Europe and the U.S. American equities slumped. The S&P 500 Index extended a stretch of listlessness as disappointing bank results in Europe added to pressure on financial shares. Yields on 10-year Treasury notes fell to 2.37 percent, while bond auctions in Europe lifted debt there. Gold topped $1,240 an ounce, and crude fell on signs of oversupply. Bloomberg’s dollar index fell for the first time in three days. Trades sparked by Donald Trump’s election continue to falter as long-awaited details on pro-growth policies remain undelivered. That’s driven demand for safety even as corporate results in Europe and America add to evidence that economic growth is accelerating. MPs will resume debating the remaining amendments of the bill to trigger Brexit today. Theresa May’s plan is on track after she won a parliamentary ballot by promising lawmakers a vote on the final deal with the EU. Seven Tory members of the House of Commons still voted against her. The U.S. Treasury Department is this week selling a total of $62 billion of three-, 10- and 30-year securities in its quarterly refunding. A strike looms at BHP’s Escondida mine. Workers at the world’s largest copper operation vowed to down tools indefinitely after wage negotiations with the company failed. The walkout will halt all production at the site. The S&P 500 Index fell 0.2 percent to 2,287.81 at 9:31 a.m. in New York. The Stoxx Europe 600 Index dropped less than 0.1 percent. GlaxoSmithKline fell after saying profit growth may be erased this year if rival drugmakers are allowed to start sell versions of its top-selling asthma medicine. The Bloomberg Dollar Spot Index was little changed, after paring a 2017 loss to 2.4 percent. The euro slipped 0.1 percent to $1.0668 and the British pound was little changed at $1.2504. Oil slid 1 percent to $51.63 a barrel in New York, heading for a third-straight drop amid speculation that rising supply from U.S. shale producers is offsetting cuts by OPEC. Copper three-month forwards jumped 1.5 percent in London after workers at the biggest mine in Chile vowed to strike. Goldman Sachs Group Inc. forecast what would be the first deficit of the metal since 2011. Yields on 10-year Treasuries dropped three basis points to 2.36 percent, the lowest in three weeks. Portugal’s 10-year debt yield fell 10 basis points while French benchmark yields dropped four basis points and Italy’s fell five. Indian bonds tumbled after the central bank unexpectedly left rates unchanged, defying market expectations for a cut to counter slowing inflation.